Politics • State Rep. Ken Sumsion will fight Gary Herbert for nomination. Tribune file photo Utah Gov. 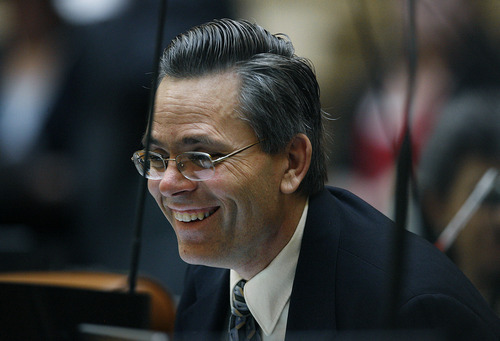 Gary Herbert has his first challenger: Republican state Rep. Ken Sumsion, R-American Fork. The governor, who is holding his biggest annual fundraiser of the year Friday night, is expected to raise more than $1 million for his campaign. Scott Sommerdorf l Tribune file photo Rep. Kenneth Sumsion, R-American Fork, says he will challenge Gov. 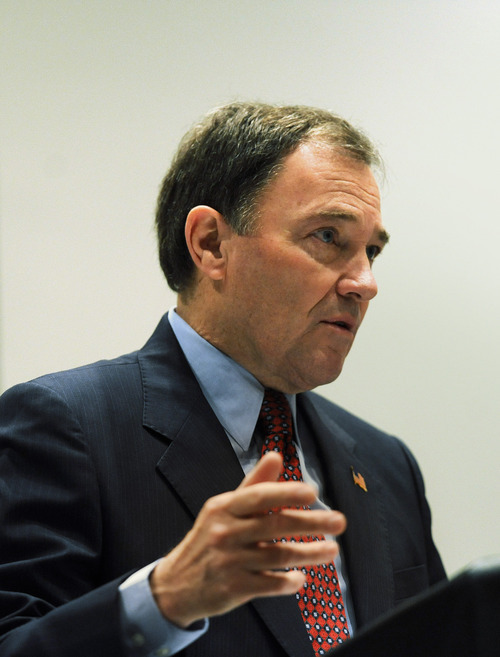 Gary Herbert for the Republican nomination for governor. The former House chairman of the Redistricting Committee says his decision is unrelated to a disagreement with Herbert over congressional district boundaries. Gov. Gary Herbert has his first official challenger, and it's a fellow Republican: Rep. Ken Sumsion, R-American Fork, who was the House chairman of the Legislature's Redistricting Committee this year. "I'm running because I believe it is our time to move Utah out of the shadows to be a national leader on issues like states' rights, public lands and education," Sumsion told The Tribune on Thursday. "I don't think I'm running against someone else as much as I am running for governor to push my issues." Liv Moffat, Herbert's campaign manager, said "The governor is focused on leading the state and not looking over his shoulder." It's not the first time that Sumsion, 48, a certified public accountant, has decided to challenge a sitting incumbent from his own party. He was elected to the state House in 2006 after defeating eight-year incumbent Rep. David Cox at the GOP convention. Sumsion is a co-founder of the conservative Patrick Henry Caucus, which says the federal government should be limited only to powers specifically given to it by the Constitution. Another co-founder, Rep. Carl Wimmer, R-Herriman, is running for Congress in the new 4th Congressional District. Sumsion is also close friends with Rep. Chris Herrod, R-Provo, who is considering running for the U.S. Senate. Sumsion said he decided to run for governor over the past two weeks as he was telling friends and family that he had decided not to seek re-election to the House. "Most asked me to reconsider and not retire from politics," he said, adding the more he thought about it the more he wanted to lead out on issues most important to him  as governor. "I want to be a leader who works with other states on solving issues such as federal lands, and getting access to them to better fund education." Also during that two-week period, Sumsion was involved in a minor controversy with Herbert  although Sumsion said it had no bearing on his decision to challenge the governor. That controversy came when documents released to The Tribune through an open-records law request included an email from Sumsion asking if the governor would veto a congressional map passed by the Senate and said his staff seemed to suggest he would. Allyson Isom, Herbert's spokeswoman, denied that Herbert or his staff ever threatened a veto and denied twisting any arms on redistricting  even though former GOP congressional candidate Morgan Philpot charged Herbert was pushing to create a friendlier congressional district for Rep. Jim Matheson, D-Utah, so he would not run against Herbert. Sumsion said that while no one from the governor's office ever specifically threatened to veto the Senate map unless some conservative rural areas were taken out of Matheson's 2nd Congressional District and put into the new 4th District, their tone made him wonder. Sumsion said his work to help lead the Redistricting Committee shows he is fair and works well with the Legislature. "Especially on the [state] House map, we drew the districts where the people are  and did not protect incumbents, and several had to run against each other," he said. Still, he said he worked with members to resolve concerns so that map eventually passed by an overwhelming 74-1 vote in the House. Sumsion said that with his background as a CPA, "I know how to look at budgets. I know how to streamline organizations and get at inefficiencies. In these unsettled economic times, that is important." Sumsion says Herbert will have far more money to fund his campaign. "I will not have the funds that the governor will. But I am hopeful that I can become the people's choice and they will be attracted to my issues. I will also work very hard." Sumsion says he will not resign his House seat  and will work through next year's legislative session, even though the law bans any fundraising during the 45 days that it meets. "I considered that. But there are too many important issues that need attention," he said. "Representative Herrod and I are planning to push some public lands bills that are important." Some other Republicans and Democrats are considering the governor's race. They include Philpot (who is also considering running for Congress), tea party leader David Kirkham and Democrats Matheson (who is also considering seeking re-election to Congress) and former U.S. Senate candidate Sam Granato.